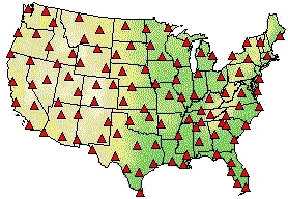 National Lightning Detection Network (NLDN) has 108 sensors throughout United States. Graphic courtesy LightningStorm.com and Global Atmospherics, Inc.
July 25, 2001 Tucson, Arizona - Since several atmospheric scientists suggested that the abnormal power surge in Hartsville, Tennessee on July 6, 2001 at 10:45 a.m. might have been a rare clear day lightning strike, I contacted the National Lightning Detection Network (NLDN), the only national lightning detection network in the United States. The network has more than 108 sensors that instantaneously detect the electromagnetic signals given off when lightning strikes the earth's surface. Each sensor transmits the lightning information via satellite to the Network Control Center (NCC) in Tucson, Arizona. Using data from two or more sensors, the "intersection" of the data enables the determination of a strike location with a 15 mile radius.